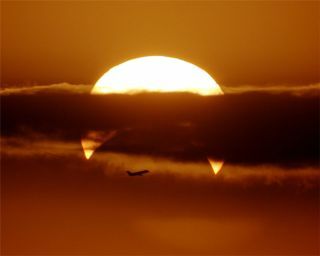 An airplane appears to be moments away from being gobbled up by the sun in this amazing view of a solar eclipse. This photo, captured by photographer Phillip Calais, shows a single moment during the solar eclipse of May 10. Here, Earth's moon is blocking the lower portion of the sun not long after sunrise Western Australia, where Calais was observing from. "Getting the aircraft in was purely a chance shot, nothing more," Calais wrote SPACE.com in an email. Calais captured this image in early from Monument Hill in Fremantle. He took this photo using a Canon 40D with Canon 400 mm f5.6 lens and a 2x teleconverter. The photo was taken at 7:05 a.m. and the sun was only about 1.4 degrees above the horizon.